This is Glyn who is not only a reader of this blog but also a poster of comments of quality and distinction. Along with its main subject the photo captures the view from the charming balcony - or is it more of a mini roof garden? - at the back of Glyn's Blurton Road flat. 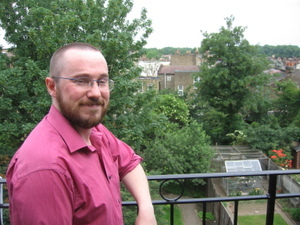 Born in Corwen in Denbighshire, Glyn works at the London School of Hygiene & Tropical Medicine and has lived in Clapton for two years. During that time he's amassed an impressive amount of knowledge about the neighbourhood. He has a few thoughts about the bus service too. There are loads of things that I can witter on about endlessly - from the mushrooming of betting shops (bad), voting (really quite good) quitting smoking (very good, but also bad) and the marvels of Hackney's cheap takeaways (bad, but also, tantalisingly good and lovely at the same time). However, I thought that I would blather about one of my pet gripes at the moment, which is buses in Hackney. Don't get me wrong. I love buses. The 38 is regular, comfortable, lovely and warm in winter and bends very cutely. The drivers are usually pleasant and often saints when faced with surly teenagers and fare dodgers. No, my problem is with the seemingly permanent gridlock that freezes Graham Road almost every day on my way home from work. I work in Bloomsbury and usually, if I take the 242 or the 38, I sail through Holborn, Islington and Dalston like a breeze. However, once we cross Queensbridge Road and enter Graham Road, it's a different world. Everything stops. The bus creeps forward foot-by-foot, metre-by-metre, creaking and making those strange keening noises. People strain to look down the road. Kids start crying (Mum looks impatiently on). The bus stops under the railway bridge. Ten minutes, 15 minutes pass - we hardly move. People force open the doors, and scuttle off towards Mare Street, with the bus driver cursing and shouting over the tannoy to the rest of the passengers (who all sit there looking startled). Kids cry again and sulky teenagers turn up their phone MP3 players even louder. One small Welsh commuter starts grinding his teeth. If the weather is passable, I usually give up and walk the rest of the way - it's a pleasant enough walk through 'the green heart of Hackney.' However, if it's rainy I'll sit, waiting and waiting for the never ending queue to move. Of course, after what often can be 15 minutes waiting, we eventually whirr around the corner to Amhurst Road. I can go home! However, as we all know, life is not that easy. So, why does this happen? Why is Graham Road so packed? I would love to know. I think part of the problem is the sheer number of buses that use that road. I have, in recent months, began wondering why, for instance, the 242 doesn`t head further up Dalston Lane, past Hackney Downs station. It's a road that is poorly served by public transport, with only the 30 taking passengers into central London. I appreciate that the 242 does provide a link from the grossly underserved areas of Chatworth Road and Homerton to central Hackney, but I do think this route needs some review. The congestion on Graham Road surely cannot continue in the way that it has forever. What is the sense of taking 45 minutes to travel from Centrepoint to Graham Road and then another 20-25 minutes to traverse a fairly small area of central Hackney to get me home in Lower Clapton! What can we do? What can the Council do?" Answers from the relevant authorities, please! try out these 38 route videos,Glyn.. Funny, but the 242 route does't have quite the same cache or cult status...not a single video in stock! Did you know that the forerunner of the 242,the 22, used to go from outside the Clapton Park Tavern, (now the excellent Thang Long House!!) to Putney Common?..did you ever wonder about the long stretch of cobbles outside the former pub? the way to LSHTM is 253 to manor house and tube to tottenham court road. u can take the bus back in the evening and red your newspaper. sorted. p.s. is prof varma's (live) tick collection still around. yeeurrch! I had the 38/Graham Road experience yesterday afternoon. The driver was very good - "It's blocked all the way up, don't know why." I got out and legged it and, true enough, there was no apparent cause for the hold up. I'm not sorry I had to walk - I needed the exercise and it gave me the perfect excuse to buy a takeaway instead of cooking. Alas, Rosemarie, the Tube is one of the luxuries that I`ve had to get rid of! Twice this week, I`ve had to walk home from the railway bridges. Today, my bus, plus the 3 others in the queue were all terminating because they were so late. It`s really crazy; something surely has to change in time. I know this is an old post and hope you don't mind my responding at this late stage but the case for biking it to bloomsbury is clear here - not only healthy for you but gorgeous too. Although I am assuming you to be able bodied biking is tremendous for the mind too. I cheat death tons of times before me days even begun. Um. Think I might have talked myself out of my own idea. Drat. Later than ever comment coming up! Just wanted to support the last speaker, cycling is the way forward! True you cheat death in the London traffic , but.. as long as you do it successfully, it's alright , no? On a serious note, it's good for your health. Really.